The rural team of Loudoun County’s Economic Development Department started a unique program a couple of years back. 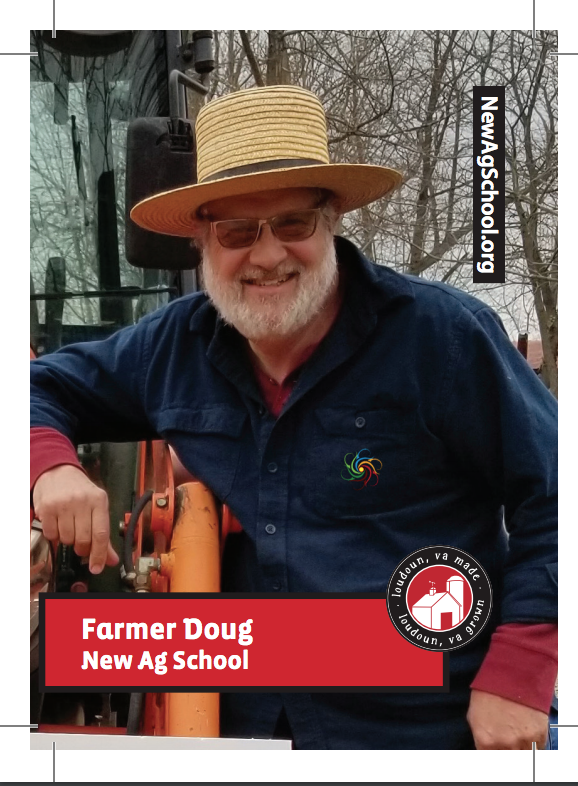 On opening day of the Major League Baseball season, in conjunction with the Loudoun County Public School Nutrition Services, they release a series of Farmer Trading Cards. The cards are distributed throughout the elementary schools through the county. The farmers featured, do a card signing and greet the students on their way from the cafeteria during lunch. 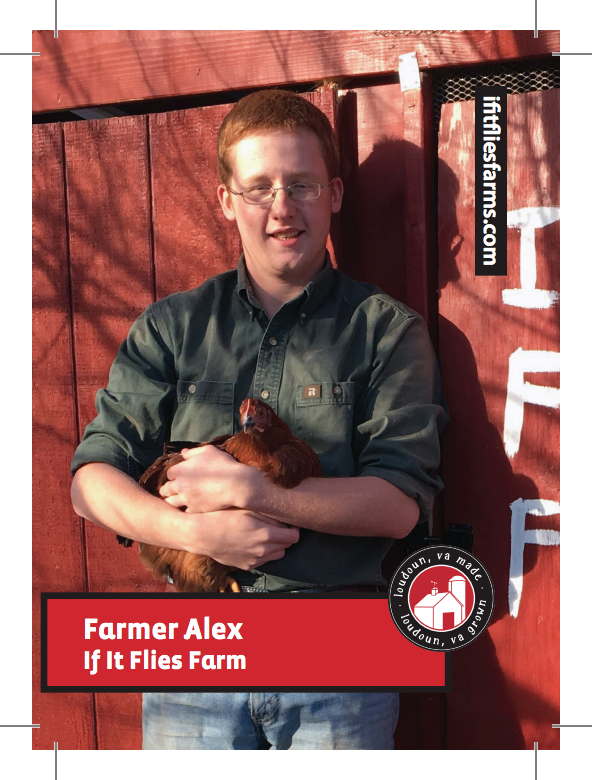 Last year, one of our former staff members and students in The New Ag School was featured on a card. 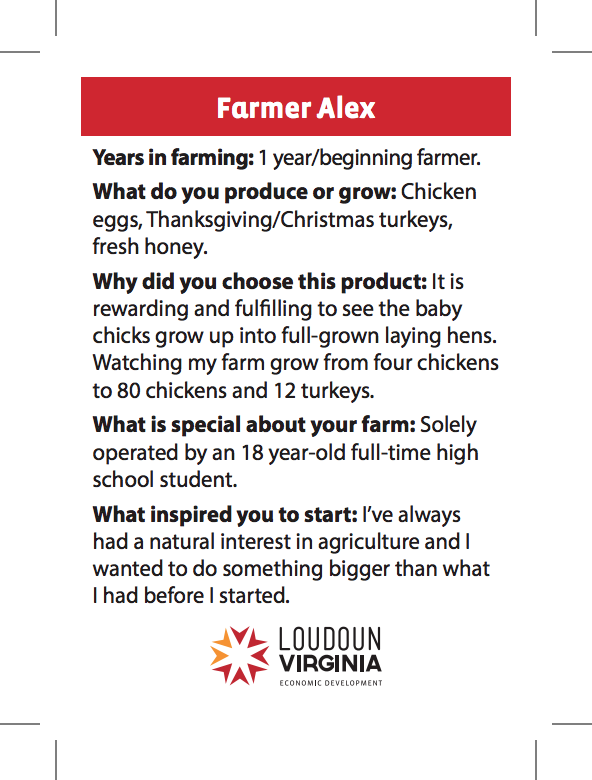 Alex is now at Virginia Tech on a 2 year program for animal husbandry. Many of the farmers featured over the years can be seen at the farmers markets, at their farm or involved with the community. As this is a public school based program, the powers that be thought it was best to not include the farm wineries and farm breweries that focus on an alcoholic beverage as their end product. I was fortunate enough to be recognized this year as the director and head farmer of The New Ag School. Our focus is to use mentoring and online modules to educate future farmers and agricultural leaders, giving our region more farmers to use these great lands for production. I had the opportunity to sign some cards for the students at Frederick Douglass Elementary School in Leesburg. We talked about animals, pineapples, strawberries, the farming lifestyle and how they rely on farmers. Pizza was on the lunch menu so it was an easy transition to talk about making cheese from milk, sauce from tomatoes and pizza crust from grains. With the fifth graders, we were able to discuss entrepreneurism and sustainability and how that related to the farm and our program. Even though these kids were not old enough to participate in our programming, they could get involved with the 4H program. Reminding them to “thank a farmer 3 times a day” was my closing line. The ability to stir up some thought with these kids is important to me. Yes, my main focus for farming is growing grapes that will be turned into wine, an alcohol based product. But understanding that crops from farms are processed into products of many types is very important. And the fact that those products are used and sold as clothes, food, fuel, building materials, decoration or whatever, is very important as well. It’s not hard for these kids to look at the food on their lunch tray and take each product back to the farm. We just need to guide them there, and to educate them that someone has a job in growing that crop as well as processing that crop into the food they recognize. I give a lot of credit to the Loudoun County Public School Nutrition Services for having the vision to reach this audience. Credit also goes to The Department of Economic Development for seizing this opportunity to connect the kids to the farmers. Our county leaders have recognized how important it is to keep our farms and farmland in the west. This effort is fundamental to establish that importance in the minds and hearts of our next generation. It is an honor to be recognized by this program and I will continue to do my part in keeping agriculture and Ag education in the forefront of our efforts. 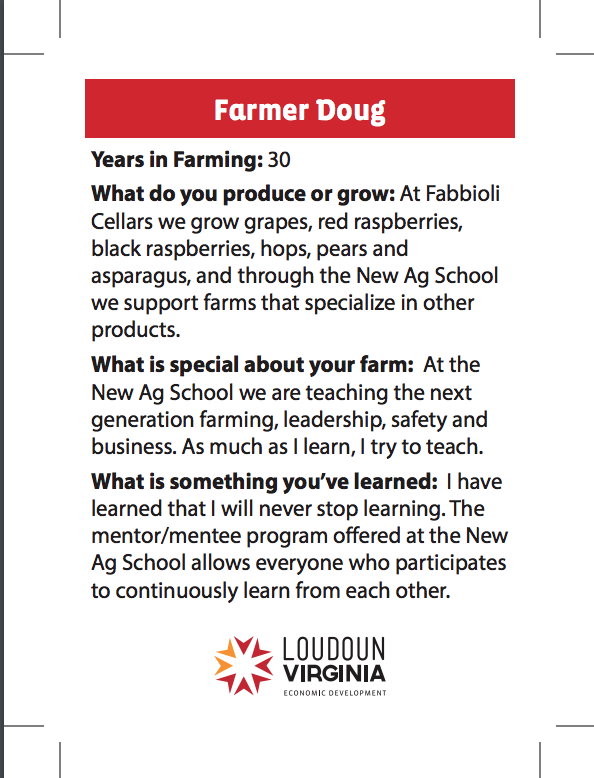 Learn more about the Ag School at Newagschool.org and like us on the Facebook! « Where is the DC Museum of Art?